One of the oldest forts and possibly one of the oldest structures of Delhi, the Purana Qila is situated in the city of the Pandavas- Indraprastha. It is believed that this historical fort was built by the Pandavas on the banks of the River Yamuna and was revered for years by the Hindus. It is believed to have been constructed even before the Mahabharata took place, and is believed to be more than 5000 years old. There are numerous sources that state that till the year 1913, Indrapat (a small village) existed within the very fort walls. During the 1954-55 excavations that were carried out by the ASI have discovered Painted Grey Ware within the for that date way back to 1000 BC thus giving this fort a much more rich history. In 1533, when Humayun renovated the fort, it was called as the city of Dina Panah, the fort was later renamed as Shergarh when Sher Shah Suri defeated the Mughal emperor and made additions to the same. 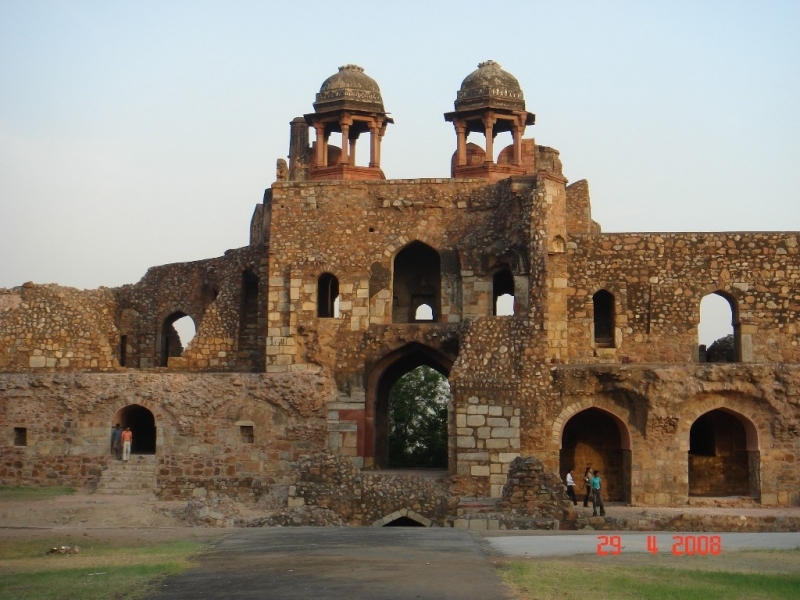 The fort walls have 3 arched gateways namely the Talaqi or Forbidden Gate, the Bara Darwaza or Big Gate which faces west and is used even today, and the Humayun Gate which is the south gate. This gate was so called as many believe that it was either built by Humayun or even because his tomb is visible from this gate. The magnificent gates of this mighty structure are bordered by massive semi-circular bastion towers, the gates are sandstone structures which are double storied. These are also ornately and intricately decorated with colored and white marble inlays and beautiful blue tiles. Known for its architectural detailing and beauty, these gates have mesmerizing overhanging jharokasa, and pillared pavilions. This displays the style of Rajasthani architecture. However few of the inner structures have survived what remains are the structures constructed by Sher Shah namely the Shermandal and the Qila-i-Kuhna Mosque. Legend has it that the Purana Qila was unlucky for the rulers who ruled for its site namely, Sher Shah Suri, Hemu and Humayun, while they ruled here, it was rather brief and followed with a battle. Humayun had infact ruled from here on 2 occasions and lost the fort to Shah Suri, only to recapture it 15 years later and unfortunately die the next year of ascending. It is said that Akbar chose not to rule from the Purana Qila and Shahjahan had even built a new fort namely the Red fort. After the Indian Independence during the Partition, in August 1947, the Humayun’s Tomb and the Purana Qila had become a refugee camps for the Muslims who wanted to migrate to Pakistan. The refugees even included over 12000 government employees who chose to serve in Pakistan, and soon between 1-2 lakh Muslim Refugees had swarmed inside the Purana Quila. It was then the Indian government had to create camps in the region, and this remained functional till 1948, as the trains to Pakistan were yet to start. Over the years the Purana Qila has become a venue for numerous concerts, events and theatre productions. Been to Old Fort / Purana Qila ? Share your experiences!